Peel pears; cut in half, leaving the stems intact. Scoop out the cores, using a melon-baller or teaspoon, and discard. Combine wine, sugar and ginger slices in a large saucepan. Heat to a simmer, stirring until sugar is dissolved. Add pear halves, and additional water if needed to cover pears. Gently cook until pears are tender but still firm (about 5 minutes). Transfer cooked pears and poaching liquid into a storage container; cool to room temperature. Lay a piece of waxed paper or parchment directly on top of pears to keep them submerged, and refrigerate until chilled. To serve: Remove pears from poaching liquid. Drain and place on serving plates cut-side-up. 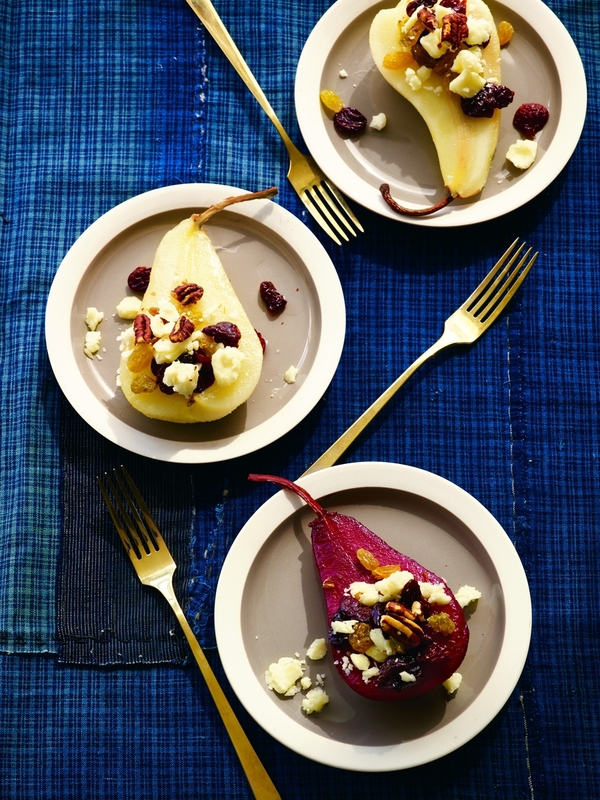 Dividing ingredients equally, fill pears with dried cherries and raisins. Top with crumbled cheddar cheese and sprinkle with toasted nuts. Heat 1 cup of the poaching liquid until reduced down to a thin syrup and drizzle onto pears.